This article is about the C-37A. For the C-37B, see Gulfstream G550. The Gulfstream V (Model GV, pronounced "G-five") is a long-range, large business jet aircraft produced by Gulfstream Aerospace, derived from the previous Gulfstream IV. It flies up to Mach 0.885, up to 51,000 feet (16,000 m) and has a 6,500 nautical miles (12,000 km) range. It typically accommodates four crew and 14 passengers. It first flew on November 28, 1995, and entered service in June 1997. It is used by the US military under the designation C-37A. It is followed by an improved version, the Gulfstream 550 (Model GV-SP). 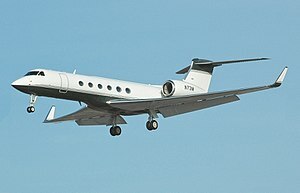 The Gulfstream V (Model GV) was certified on April 11, 1997. Compared to the Gulfstream IV, the engines are changed from Rolls-Royce Tay to Rolls-Royce BR700-710A1-10 with increased thrust, higher bypass ratio, and Full Authority Digital Engine Controls (FADEC). Operating ceiling is increased from 45,000 ft to 51,000 ft. It has thrust reversers and composite flight control surfaces. The horizontal tail area is 30% larger, wingspan is increased from 74.6 ft to 93.5 ft, the fuselage is lengthened by 5 foot forward of the main entry door, and by 2 foot aft of the wing. Maximum takeoff and landing weights are increased by 15%. Capable of flying up to 6,500 nmi (12,000 km), it rolled out in 1995 and was Gulfstream's first ultra-long range business jet. Total production of the Gulfstream V was 193 aircraft. By 2018, 1997-1999 Gulfstream GVs were trading at $8.8-10.25 million. Designated C-37A in U.S. Air Force service, the Gulfstream V is used by United States government and Defense Department officials. The US Coast Guard operates two C-37A for transportation of the Secretary of Homeland Security and the Commandant of the Coast Guard. The US Navy operates one C-37A. The aircraft has a flight management system with a GPS receiver. The C-37A is capable of cruising at 51,000 feet (16,000 m). Features include enhanced weather radar, autopilot and head-up display for the pilot. Safety features include Enhanced Vision Systems that allows increased visibility in adverse environments. The aircraft is also equipped with commercial and military communications equipment to provide secure voice and data capability. The U.S. Air Force equips the C-37A with a basic crew of two pilots, one flight engineer, one communications systems operator, and one flight attendant. It accommodates 5 crew and 12 passengers. The majority of G-Vs are operated by corporate and individual owners. Mark Cuban paid $40 million for a Gulfstream V in October 1999, earning a Guinness Record of "largest single e-commerce transaction". Steve Jobs received a Gulfstream V as compensation from Apple in 2000. Hellenic Air Force operates one Gulfstream V for VIP transport. Japan Coast Guard received the first of two G-Vs on January 17, 2005. Dubbed "Umi Washi" (Sea Eagle), the aircraft will be operated by the JCG for maritime surveillance search and rescue. The second aircraft was delivered in mid-2005. Saudi Arabia operates two GVs in a medevac configuration. The 89th Airlift Wing's 99th Airlift Squadron, Andrews Air Force Base, Maryland, operates four C-37As. The 6th Air Mobility Wing's 310th Airlift Squadron, MacDill Air Force Base, Florida operates three C-37As. The 15th Airlift Wing's 65th Airlift Squadron, Hickam Air Force Base, Hawaii operates one C-37A. The 86th Airlift Wing's 76th Airlift Squadron, Ramstein Air Base, Germany has two C-37As. The Executive Transport Detachment Pacific, Hickam Air Force Base, Hawaii operates one C-37A. The United States Army Priority Air Transport Det. (USAPAT), Andrews AFB, MD, operates two C-37As. On March 11, 2005, Gulfstream delivered an ultra-long-range G-V to the National Center for Atmospheric Research (NCAR). The aircraft—known as the High-performance, Instrumented Airborne Platform for Environmental Research (HIAPER), based in Boulder, Colorado, is being used by environmental and atmospheric scientists from both public and private research facilities. 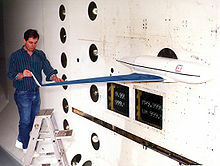 The GV was chosen by NCAR for its exceptionally high cruising altitude, long range, endurance, payload, reliability, and low operating costs, as well as worldwide product support. The HIAPER Gulfstream V is modified to accept wing/pylon mounted instrumentation. United States Coast Guard operates two C-37As for executive transportation of the Secretary of Homeland Security and the Coast Guard Commandant as of January 2012. Federal Aviation Administration operates one Gulfstream G-IV with tail number N1. Federal Bureau of Investigation & Department of Justice operate one Gulfstream G-V.
Federal Emergency Management Agency operates one Gulfstream G-V for team transport in disaster response. National Center for Atmospheric Research operates one Gulfstream G-V for scientific research. ^ a b c "Gulfstream History". Gulfstream. ^ a b "Gulfstream V Fleet Achieves 1 Million Flight Hours" (Press release). gulfstream. May 13, 2012. ^ a b c "C-37A". US Air Force. May 12, 2003. ^ "Model Designation of Military Aerospace Vehicles" (PDF). DoD. 12 May 2004. ^ a b "Type Certificate date Sheet NO. A12EA, revision 46" (PDF). FAA. February 22, 2016. ^ Mark Huber (December 2018). "For many models, market hitting the apex" (PDF). Aviation International News. pp. 20–21, 24. ^ "Apple Board of Directors Announces CEO Compensation" (Press release). Apple. January 19, 2000. ^ "Gulfstream Special Electronic Mission Aircraft Delivered to Israeli Ministry of Defense" (Press release). Gulfstream. 14 June 2005. ^ "Gulfstream Delivers Four Special Mission Aircraft And Receives Order For One More In 1Q05" (Press release). Gulfstream. April 21, 2005. ^ "Gulfstream Aerospace G-V Gulfstream V - State of Kuwait". Airliners.net. ^ "Gulfstream Aerospace G-V Gulfstream V - Saudi Medevac". Airliners.net. ^ "C-37A arrives at Hickam AFB". U.S. Air Force. November 29, 2006. ^ "HIAPER Gulfstream GV". National Center for Atmospheric Research. ^ "C-37A (Gulfstream V) and C-37B (Gulfstream 550)". U.S. Navy. ^ "C-37A: Gulfstream V". Office of Aviation Forces. United States Coast Guard. January 26, 2012. ^ "Gulfstream GV Brochure" (PDF). HIAPER. ^ a b c d e "Gulfstream aerospace G-V Gulfstream V". Airliners.net. This page was last edited on 15 February 2019, at 19:27 (UTC).